Will Obama change US Africa policy? 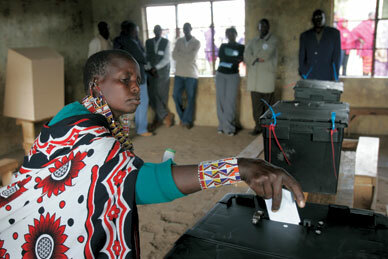 KAREL PRINSLOO/AP A Masai woman casts her ballot during the December 2007 presidential election. Change. It’s the word on everyone’s lips here, just as it is in the United States. After a violent few weeks last January following a contested presidential election, Kenyans would like nothing better than a way out of the political, land and ethnic clashes that periodically afflict the country and that in the most recent case could so easily have turned into full-scale civil war. A Gallup poll released in October showed that 70 percent don’t think the election was honest and that only 25 percent believe that the incumbent, Mwai Kibaki, actually won his re-election bid. On the economic front, with inflation running at close to 30 percent and nearly half the population living in poverty, a majority think conditions are getting worse. Yet where that change will come from is not clear. Right now, members of the coalition government that Kofi Annan brokered to end the carnage seem to be spending more time sniping at one another and maneuvering for influence than dealing with the root causes of the election disaster. If the past is any indication, the United States is not likely to be a lot of help–any more than it has been elsewhere on the continent. From its support of the apartheid regime in South Africa to its endorsement of Kibaki’s win despite strong evidence that showed he’d lost, US policy in Africa has always been much more about preserving the status quo than welcoming new directions. And from what I’ve seen since returning to Kenya in 2005 after many years away, finger-wagging–metaphorically if not literally–remains the hallmark of American diplomacy. According to Kenyans and Westerners with experience on the continent, there’s not a lot of reason so far to think–though there is certainly plenty of hope–that Obama administration policy on Africa is going to be much different. During the campaign Obama turned for advice to veterans of the Clinton administration, which, among other things, failed to act in Rwanda, balked at submitting Americans to the jurisdiction of the International Criminal Court and pushed free-trade agreements that African countries rebelled against as unfair. Obama’s top Africa advisers have spoken favorably about the Pentagon’s new command, Africom, which reinforces an already overmilitarized approach to Africa, while Obama has offered no meaningful criticism of the Bush administration’s disastrous policy toward Somalia, Kenya’s northeastern neighbor. That policy has seen the United States bomb Somali towns, killing dozens of civilians; “rendition” suspects and their families; and send suitcases full of cash from Nairobi to Somali warlords, all in the name of fighting Al Qaeda. Obama will inherit a military aid budget for Kenya that was eight times higher in the five years after 9/11 than in the five years before and a State Department that has increasingly ceded policy-making to the Pentagon. Just how much of a break with the past is needed in Africa is amply demonstrated by the US role in Kenya’s 2007 presidential election, in which Kibaki was declared the winner over his chief challenger, Raila Odinga. Kibaki, an economist who served under the country’s first president, Jomo Kenyatta, in the 1960s, pointed to the country’s rising GDP during his first five-year term as evidence of his effectiveness. Odinga, whose father was a populist–the Americans at the time labeled him a Communist–opponent of Kenyatta, campaigned on a promise of change, arguing that the country’s high unemployment and uneven regional development were evidence of the need for new leadership. While I had only an outsider’s view of the election process, I, too, saw things that made me wonder. On December 17, little more than a week before the election, Ranneberger gave a curious interview to one of the major dailies. Despite having described corruption in Kenya as “like a cloud hanging over the nation” a few months after his arrival in 2006, and having told a university audience in mid-2007 that “not enough has been done to bring to justice those responsible for corruption,” he now claimed that corruption wasn’t a big deal after all. “I always point out that we have lots of corruption even in the US,” Ranneberger said breezily, mentioning Enron as an example. Such incidents, in retrospect, were a portent of what was to happen to the exit poll IRI conducted on election day with the aid of a local polling firm, Strategic Public Relations and Research, assisted by polling experts from the University of California, San Diego. The poll–which asked voters whom they’d voted for–showed that Odinga had bested Kibaki by an eight-point margin. This was in contrast to the official figures released later, amid chaos and allegations of rigging, that showed Kibaki winning by a two-point margin. Plans called for releasing the poll, the only one of its kind (a second exit poll by a different organization was begun but not completed), the day after the election. But instead, IRI’s top Washington-based officials, claiming they had serious doubts about the poll’s validity, refused to make the results public. Flottman says he kept pressing for an answer as to why. “I was eventually told that it wasn’t in the best interest of IRI,” he says. Ranneberger was given the poll results on the evening of election day, December 27. This was three days before the official announcement that Kibaki had won touched off weeks of rioting in which more than 1,000 Kenyans died and as many as 350,000 were made homeless. Nonetheless, Ranneberger went on to tell the Washington Post on December 31 that “the US would accept” the announcement that Kibaki had won, and the State Department congratulated Kibaki on his win–a position that it later retracted after the European Union raised concerns about election rigging. An even bigger issue is whether the exit poll’s release might have altered the outcome of the race. Njeri Kabeberi, head of the Center for Multiparty Democracy, a nonpartisan group that focuses on party building, says that if the results had been made public quickly “it would have made a big, big difference” by deterring vote tampering. That opinion is shared by many, but not all, outsiders. Tom Wolf, a US polling expert who lives in Kenya, says, “It would have fueled [Odinga’s party’s] claims to legitimacy, but Kibaki wouldn’t have given up without a fight.” Wolf, who consults for a rival firm to Strategic, also says he has some reservations about Strategic’s polling methods. Flottman, for his part, continued to press for the poll’s release, even after he left the country at the expiration of his contract. “The fact is, it’s the only independent source of data” on the election, he says. And in the end, after the University of California polling experts made a public presentation on the data and methodology in Washington, IRI backed down on its earlier position. After what it described as an “extensive analysis” that reduced Odinga’s margin from eight to six points–still significantly larger than the poll’s margin of error of less than two points–it made the poll data public in August. By then, it was way too late to make any difference: pushed by the international community, Odinga had dropped his insistence that he had won, and he and Kibaki had agreed to form a coalition government, with Odinga installed in the newly created and, as it quickly became apparent, relatively powerless job of prime minister. Even more worrying is Kenyans’ growing cynicism about electoral politics. “Faith in the integrity of the election process was seriously compromised” by the election tampering, says the pollster Wolf–an observation borne out by the October Gallup poll, which recorded a steep decline in Kenyans’ trust in the honesty of elections. What appears to have happened in Kenya is by no means unique. In 2005 the United States rallied around Ethiopia’s Meles Zenawi–Ethiopia being a major ally in the “war on terror”–despite evidence that he had lost badly. And US endorsement of dubious results in other African countries, most notably oil-rich Nigeria, have been the norm for years. Still, there’s something particularly depressing about the fact that it occurred in Kenya, whose citizens I’ve often thought were the most optimistic people on the planet–filling night classes at the university and seemingly buying and recommending to one another every self-help book ever published. No one in Kenya expects Obama to produce miracles. But changing perceptions like these would be a start. After that, maybe he could ask Kenyans what they’d like to see in the way of change they can believe in.